Now The Details: Local TV News: Death By Self-Inflicted Wounds? Local TV News: Death By Self-Inflicted Wounds? Rumors abound that the CBC, faced with yet another budgetary shortfall, will put an end to all local TV newscasts across Canada in an announcement scheduled for later this week. If that happens, hundreds of jobs will be lost, and at the same time, a sign that commercial TV news values now predominate in Canada, just as in the US. Will it mean that audiences for local TV News on the CBC will be losing very much? I don't think so. Local TV news - even on the CBC - has become a haven of hype for traffic accidents, tornado sightings and hysteria about crime. This terrible trifecta of weather, traffic and crime is a formulaic approach that works. Sort of. Audiences for this menu skew older and whiter. TV news in general validates their fears by pounding away at how unsafe its "out there." 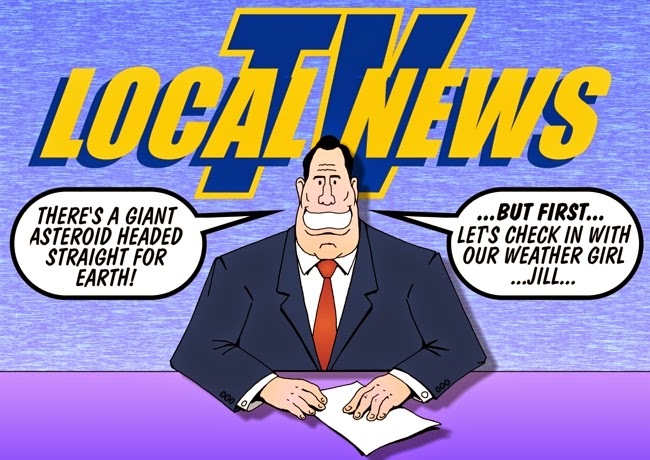 Most people still get their "news" from local TV. Those audiences are in decline even as local CBC TV news tries to sound both populist yet informed. The result on CBC, at least is a sense of posh inauthenticity. Ratings for local CBC TV news are low and falling. Commercial stations seem to do this better due to a real connection to the audiences who are interested in this kind of news. I got my first full time journalism job in TV news at the CBC in Montreal in the mid-70s. It was a great experience and I eventually became the city hall reporter. Our newsroom had some very talented senior people and I learned a lot from many of them. But try as we might, we could not beat the other English-language station in Montreal, CFCF. They just killed us, in rating period after rating period. I think we came across as too intellectual at a time of political turmoil, when TV audiences in English Montreal were looking for something more emotional, more connected, more secure. Finally, in a stroke of genius (or possibly desperation), we hired away CFCF's anchor, Andrew Marquis, a beloved Ted Baxter-type icon in English Montreal. The ratings began to turn our way and it looked like we would finally beat the opposition when Andrew suddenly died of a massive heart attack. As a host, Andrew was simply irreplaceable and CBC's audience numbers plummeted as the viewers returned to CFCF. Getting back to today, it pains me to say it, but if these local CBC TV newscasts are cancelled, it would be no great loss. Even with the wealth of talent on many of these shows, their efforts have been undermined and misdirected by the CBC's trolling for ratings. Increasingly, I'm hearing that people are fed up with being frightened and they are turning off their TVs. Michael Getler is the ombudsman for PBS based in Washington, DC. Writing in his latest blog he says, "I've given up watching the local 11 p.m. television news (NBC) because, aside from weather and sports, it is a relentless recitation of murder, gun violence, sexual assault, fraud, fire and misery just before bedtime. My guess is it is much the same on other channels in other major cities." O'Donnell and Getler may not be the core audience for local TV News. But they should be and many like them are opting out. Crime rates in Canada and the US are in decline for a variety of reasons. Crime reporting, especially on television has risen 800% in the past decade, according so some researchers. The reasons for this are obvious: the news business is looking for ways to attract eyeballs (and ear drums). Spending money on more reporters, producers and technology is out of the question. So news managers are looking for so-called "low-hanging fruit" that can get on the air and into the newspaper "news hole" as quickly and as cheaply as possible. Weather, traffic and crime are there, ripe for the picking. Curiously, as news organizations are told there is less and less trust in what they do, they have become increasingly dependent on these three narratives. And all three come from government agencies. There is also research claiming that news that heavily relies on these extended disaster themes, tend to make people less trusting of governments, of their neighbors and even of civic engagement. In short, violence in the news has an effect on voter turnout, because it endorses a sense of hopelessness in society. If the CBC shuts down its supper hour newscasts, that may be a glimmer of good news after all.